Today commemorates the 100th anniversary of my grandfather’s birth. Stephen Lim Beng Soon, my grandpa was born in Kuching on 10th October 1910, one of the 12 children of a humble Assistant Surgeon at our local General Hospital back in the early 1900s. Grandpa was schooled at St Thomas in Kuching and was baptised on 3rd April 1920. 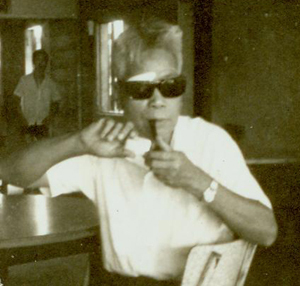 After his father, Lim Swee Kim, drowned in a boating tragedy near Pulau Lakei in 1923, grandpa and his 9 siblings were brought up by an aunt (mak-ko). After he finished his studies, he joined Land and Survey as a clerk. He was later transferred to Sibu. Sibu was where he met my grandmother, Chew Kim Eng. Together they brought up a brood of 11 children. Grandpa brought up his big family with his meager salary and stayed in a government quarters with only two rooms. The boys had to sleep in the living room and the dining table was a prime sleep bed. 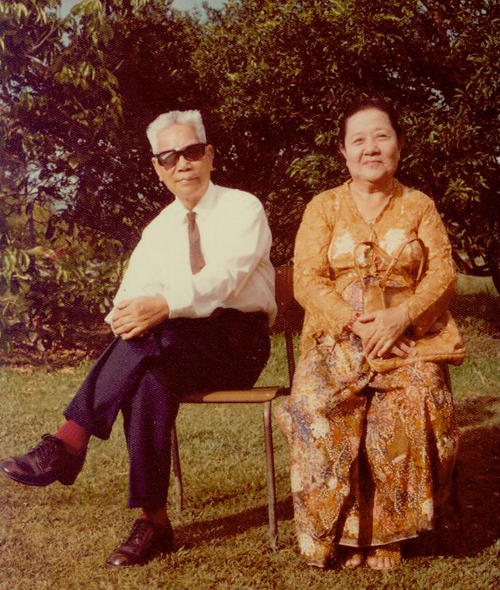 The young family later moved to Miri in 1951 and when grandpa retired he was given a choice to move back to Kuching but he decided to make Miri his hometown and was offered a piece of land by Land & Survey at Tanjung Lobang, fondly known to us as no.7. Grandpa was a man of few words, no gossiping, no bad temper, read a lot and loved listening to his BBC news and marching band (and John Denver) on his Bendix radio. He was a grandpa who would tease and joke with us but he would also pull our ears if we were naughty. He would play mahjong with his elder kids and daughters and sons inlaw. He was a billiard player too before he had so many kids to look after. Remembering grandpa is like remembering all the good times we had at no.7 because every weekend was a family day. Grandpa would cooked for a small army and he loved cooking. He was a great cook who cooked as his heart pleased. His signature dishes were chicken curry and beef stew. He would let us organized Christmas parties, weekend and holidays mahjong sessions and there were definitely a spread of great food. Picnics by the beach were the best as grandpa would bring along his makeshift mahjong table, he would catch bubuk to make belacan and we would barbeque by the beach. What is vivid was the smell of his Erinmore tobacco and cigar. Grandpa was a pipe smoker and the older grandkids would learn how to clean it for him. The reward for job well-done or just being a good boy/girl, would be found in his wardrobe some chocolates or mint sweets or even bubble gums. And so today we pay homage to this great man in our lives. We’ll always miss our Ah Kong. What sweet memories! The joy of growing up with Ah Kong. Ah Kong, we miss you .. you left us all too early .. we treasure the times we all shared at No. 7 Brighton Road. Hey, your grand pa looks really good with the pipe on the photo. A little late ….. but a reply not to be missed …. Ah Kong we still miss you after so many years!!!! Reading about your life brings happy memories of No 7.
btw, thanks for posting great granpa Swee Kim’s picture. i’ve always wanted to know how he looked like. My dad used to talk about him & my granpa a lot when i was young. its also sad that i only got to know my granpa for only 4 years before he passed away. You and I haven’t had a chance to meet yet (I’ve met your siblings though). Glad to know you appreciate your family history. There’s clearer picture of great-grandpa some where in this blog (I think under the heading ‘grave hunting’). My family used to visit great-grandma at Lintang Park. Though she was actually our step great grandma but she loved us all the same. To me she was my great grandma and I loved her. Without a doubt, from great grandpa to your grandpa and my grandpa and our dads, they have showered us with so much love. It is the one thing that’s keeping us bonded to this day.